Redblock wrote: Back in '94(?) the Cotton Bowl hosted 1 or 2 of the preliminary matches when the US hosted the World Cup. Now Dallas is on the list of 23 cities which could host games for the 2026 World Cup. They also located the media center for the whole thing in Fair Park. tamtagon wrote: ...still pissed LaMiller turned The Cowboys away from Fair Park. If that were only true then that would be the one thing to like about her. The reality is that Jerry Jones insisted that the county commissioners (not the city) schedule the referendum for the taxpayer funding immediately, knowing they wouldn't/couldn't do that. So he was able to claim he gave Dallas a shot, when he never had any interest at all. The politics and scheduling was whacked out, but the county would have done it. LaMiller was leading the No Way coalition. ...Jerry Jones confirmed that Miller basically told him "don't let the door hit you on your way out" when he approached her with the idea of building a $600 million stadium in Fair Park back in 2004. LaMiller was a champion for downtown and helped orchestrate the vitality that's still growing. She put all the focus resources Fair Park needed into the Trinity River Park. Hundreds of millions from the city and/or county for a new Cotton Bowl was never part of the former mayor's plan. Oh please adding Jerry world to fair park would have been catastrophic for South Dallas. That would all but guarenntee the perpetual use of the parking lots that cut the area off from humanity. Not to mention the gates around the complex (People aren't gonna feel "safe" leaving their cars there). Furthermore, the city would have to fork over hundreds of millions to the richest sports franchise in the world for a private stadium.GTFOH. Not having the Cowboys is a blessing in disguise for South Dallas. We actually now have management who wants to connect the area to the city and revitalize the area. Not to mention citizens who want to make the park a true gem. On the sports front, I was looking around Spectra's website, and noticed that they manage the Cal Expo fairgrounds in Sacramento. Under their management (http://www.spectraexperiences.com/wp-content/uploads/2015/06/California-Exposition-State-Fair_CaseStudy.pdf), they are now the home venue for the Sacramento Republic (a USL team that is often brought up in the conversation of the "next team to jump to Major League Soccer"). I know that FC Dallas is going to be starting a USL 3 team next season, or at least it has been rumored. In all likelihood, they will play up in Frisco, but it'd be cool to bring some of that back to the Cotton Bowl like the old days. Random note: Isn't it kind of funny that Spectra is owned by Comcast, while Spectrum (cable company) was formerly Time Warner Cable? What a world we live in, huh? Jerry Jones also wanted a completely modern stadium not just in function but in design. Putting it in Fair Park would have not only meant tearing down the Cotton Bowl but the new design would have had to include art deco and historical design context which Jerry Jones could care less about. ANy design would require review from multiple governmental bodies on local, state and federal levels. His stadium footprint would also be quite a bit bigger than the Cotton Bowl and most of the surrounding buildings would have had to be severely modified or removed to make it happen. Of course, to some people, Fair Park, and its historical buildings as they are now are dead weight so to them they wouldn't care about that but it would require a mountain of political will not just local but the federal level to tear down the protected buildings. All things that could eventually be overcome with money and the city pushing hard for it but it would have slowed the project down immensely and Jerry has no romanticism for the City of Dallas or Fair Park. Jerry Jones like a petulant child wants what he wants when he wants. He has the most profitable team in the league and expects city hall to bow down to him for it. Laura Miller wasn't without faults that's for sure but she also wasn't willing to bankrupt the city in more than one way just to beg to Jerry Jones and the sacred cow of the Dallas Cowboys and I love her for it. Congrats to Spectra and the Fair Park foundation that will be overseeing all changes they will be made to Fair Park. Some will probably upset me but to do what we were doing under the cities bad management was not working. I for once like the fact that the city has required the first project to be completed would be a neighborhood park element. The Fair Park neighborhood deserves that land to be accessible and to increase their quality of life. Instead, it continues to hold all the property around it in constant depression. ^Wow that is an amazing comparison but imagine that plus the sea of parking that would have been required and what that foot print would have looked like. The plan would have been to demolish the Cotton Bowl and shift the new stadium a little further to the east by demolishing the Expo Center(blue rodeo arena) and also building into areas where the Top O' Texas Tower stands. It would have fit size wise. Starplex would have gone away. There would have been major reconstruction of Grand and Fitzhugh as ingress/egress from I-30. It would have worked and it would have preserved Fair Park's Centennial buildings. The real damage done to Fair Park was when the Morton Meyerson, Perot Museum and the arts district pulled up stakes and moved out of Fair Park. It will take Fair Park generations to recover from that. As a native Dallasite I am happy to see Spectra as the chosen vendor. I like going to events at Fair Park outside of the State Fair. Some of those plans you speak of to make room for a stadium work in Fair Park were pipe dreams as much as a new stadium would be in general. They were concept renderings without any real groundwork done. They certainly were pretty pictures that looked good on TV though. You try putting an elephant in a tea shop without breaking a few dishes. I agree though when the 1% in Dallas decided to move all of the Arts and Museums to the Arts District that was the bigger doom to Fair Park more than anything. Institutions like that would provide a lot more valuable customer base that doesn't overload parking lots causing massive parking garages or lots etc. Fair Park was the original Arts District after all and the rate of daily visitors and smaller events would have provided a nice steady stream of visitors. 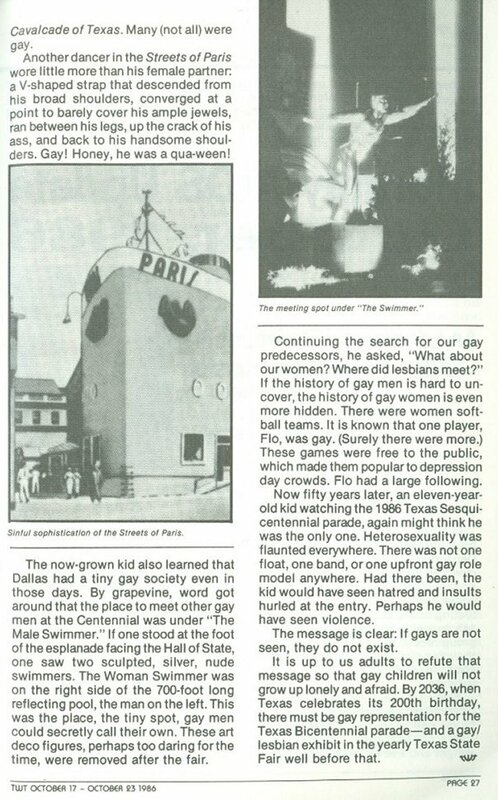 I've always wanted to see a June Pride festival return to Fair Park, since that was the original home of Razzle Dazzle starting in 1979. Totally understand why it's a controversial decision, however, but I hope everyone gives it a chance. I feel like putting it in Fair Park makes it feel more like an inclusive 'DFW-wide' type of festival. That definitely gives DFW a more positive image that we, as a metroplex, are celebrating pride with such a big event. At least that's how I perceive it. I do like that this will be able to house more people, so I hope this does help it grow into an even bigger event. Personally, I am someone who lives on the street so there is a list of positives and negatives here but let's straighten out the facts and please feel free to correct me if I get something wrong. Keep in mind they have only committed to moving the PRIDE FESTIVAL out of the gaybourhood well it was already really. The festival has been held down the street for a while now in Reverchron Park and Arlington Park depending on what year we are talking about and no one I know goes to that part. They wouldn't be trying to move it to a bigger park if absolutely no one goes to the festival but just none of my immediate circle attends the festival part so seeing them move it isn't a big deal I guess. The parade they haven't decided what to do yet. They want to do something that puts pride front and center but the problem is Main Street in Downtown is not the center of DFW or even Dallas life for that matter. Can you put a pride parade down Central Expressway lol. Where do you parade drag queens and boys in short shorts and cowboy hats where they will be as welcomed as big name sponsors who wear more modest rainbow clothing like Amercian Airlines and Bank of America? They want the parade to get bigger because honestly right now its too long. It goes for hours and by the time the last sponsor goes by everyone I know has already been drunk since Friday, Saturday and now Sunday so they've gone home. The biggest party is Saturday night in the bars the night before and Sunday midday right before and during the beginning of the parade. McKinney Ave: Uptown? Elm Street: Deep Ellum? Riverfront Blvd from Oak Lawn to Continental? Greenville Blvd? Good Latimer from Uptown to Deep Ellum? Main Street: Downtown CBD. Most likely I still won't go to the Pride Festival in Fair Park because I still haven't seen what's the use in going. I work as a bartender the Saturday night before at the gay bars. Where ever the parade is moved I hope to go but I hope it's a quick scooter ride to get there. If they keep the parade inside Fair Park maybe but I guess it will just become The Great Gay Fair of Texas! If so can we please borrow big tex and put him in booty shorts, a boa and some sort of feathered headpiece. One of my favorite stories from the 1936 Centennial Exposition is how gay men would gather under the Tenor sculpture in the Esplanade to cruise and meet other men. There's a rumor that R.L. Thornton was so distraught by this that he had the statues removed for this reason (one of many theories about the statues' initial disappearance). With the festival at Fair Park, the Dallas Pride festival will probably attract more visitors than any other in the South. If visibility is one of the goals, this move is the right action regardless of where the parade happens. After a couple years, I would imagine the Cotton Bowl will be used for concerts. I would be happy with a linear park on the Cullum side as long as it had all the needed functions for a neighborhood geared park. I would also still support the rebuilding of RB Cullum to a more condensed street format. The current street is massively wide with lots of land wasted on giant medians which do more to create a moat than connect anything which to be honest is partially the intent of its design. The city could follow something similar to the old Comprehensive Fair Park plan that suggested condensing the Blvd into a smaller footprint, the same number of lanes but with useable crosswalks and sidewalks with additional land to go towards the park. In summary, make it an Urban Blvd rather than a suburban arterial as it is now.